Benefits of New Installations: Energy efficiency standards have been on the rise and today’s new air conditioning and heating systems have been built to run more efficiently. Upgrading to a new air conditioner or heating system can help save you a significant amount of money on energy bills, a savings of about 30% in some cases. Let us MOR AIR INC help you find an energy savings solution that is right for you. All of our new installations come with a warranty* on parts and labor. Just like a car, an AC and heating system requires periodic maintenance. The average AC holds a lifespan of about 17 years but only regular maintenance will help ensure a long system life by preventing mechanical failure through a proper tune-up or finding and correcting potential problems before they get worse. Keeping up with maintenance also helps with maintaining the proper indoor air quality which can prevent airborne allergy symptoms and odor problems. Call MOR AIR INC to schedule maintenance service at the special rate price today. Like all machines, your AC and heater will experience wear and tear that will lead to breakdowns requiring repair. The average HVAC system will develop leaks and other problems after 5 years and that is when you need to make the call for an expert to come service the unit. MOR AIR INC. will send out a fully trained and licensed technician to properly diagnose issues with your AC or Heating unit, provide an estimate for repairs and make professional recommendations. If immediate repair is not done only a diagnostic fee will be charged, but it can be later applied to total repair cost. No JOB TOO SMALL: Maybe you are tired of looking at your old thermostat and want to swap it out, or perhaps you can’t figure out what that strange sound or smell is that is you think is coming from your AC or heater is making. 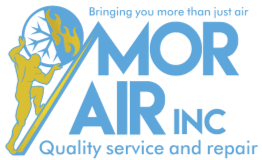 Whatever the case, give us a call and MOR AIR INC. will come out to help answer all your questions and find the right solution.